Guts Casino is one of the best when it comes to providing iGamers with blackjack options. The fact that they use multiple software providers and are always willing to expand their catalogue when there is something worthy coming out makes them one of the best online casinos for real money blackjack players. Guts has many deposit options for players in a range of local currencies. Guts Online Casino is completely instant-play, this means there is no downloadable client for any platform, making it extremely fast for players to get started. The interface operates smoothly on iOS, Android and other smartphones as well as most tablet devices that support flash. On top of this they also offer an enticing $300 Welcome Package, which also includes free spins on the Starburst slot machine. You can read on for further details about Guts Casino’s exciting range of blackjack games, both live dealer and RNG versions. Atlantic City Blackjack Gold Series: The dealer is dealt two cards to start with, one face up and one face down. The face down card is called the hole Card. The dealer will check their hole card if their face up card is valued 10 or an Ace. 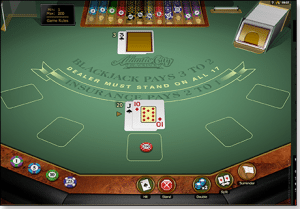 Atlantic City Blackjack, which originated in the 1970s, has two main differences to standard blackjack games, these are that eight standard decks are used instead of six. 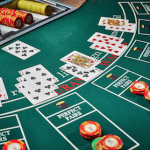 The second difference again involves in the odds; if the dealer has a card valued 10 or an Ace, but haven’t hit blackjack after checking their hole card, the player has the option to Late Surrender. This means the player can give up half their original stake and forfeit the hand because of the very real threat the dealer will have a strong combination because they have a face up 10 or Ace. Premier Blackjack Multi-hand: This is a Microgaming blackjack multi hand game. The player can wager up to five hands at once and have the option to make their gameplay quicker by using Auto Rebet and Turbo Play. There are also customisable cosmetic features available. The gameplay follows standard European blackjack rules. Blackjack Classic: This is a NetEntertainment game which has proven to be very popular with Guts players. While Guts does not have the low limit and high limit version of this game the version they do have has a minimum bet of $1 and a maximum limit $40 per hand. This game also offers players the opportunity to play up to five hands at the same time. Double Xposure BJ: The quirk of Double Xposure blackjack, by NetEntertainment, is that both of the dealer’s cards are dealt face up. This is a common game that you often find in brick and mortar casinos around the world. This game has even money payouts on all player wins. Pontoon: This is very similar to the American game Spanish 21, but might be found under a different name to Pontoon. 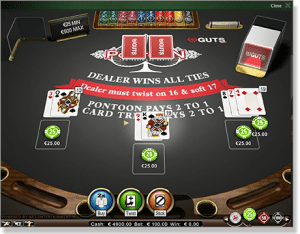 At Guts there are three different table games, with the difference being the cost to play. The table variants are $0.10-$5, $1-$40 and $25 to $500. 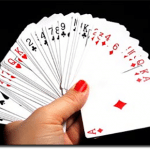 The aim of the game is just like normal blackjack, beat the dealer’s hand without busting. 21 is called Pontoon in this game. If a player uses the correct strategy they can reduce the house edge to 0.5 per cent. Pirate 21: This is a BetSoft title with a minimum bet of $5 and maximum of $500 per hand. A player’s blackjack always beats a dealer’s blackjack and there are several variations in payouts for hitting certain cards. For instance if you hit 7-7-7 suited and the dealer has a seven face up you receive $1,000 for bets of $5-$24 and $5000 if you bet more than $25 on the hand. Blackjack Professional Series: This game allows the player place a side bet called the Double Jack. To win the side bet you need to hit at least one jack in your initial hand. To really hit the jackpot you need to hit two jacks. To place the side bet you place your chips on the Jack symbol next to the betting square. While the payouts deviate depending on the suit and how many Jacks you have hit, the ultimate payout is two Jack of Spades, which pays 100-1. Single Deck Blackjack: This is a NetEntertainment title that offers the player a 99.55% payout if correct strategy is played. It, as it sounds, is played with one single deck of 52 cards that are shuffled before each hand. Often single deck blackjack online can have rules introduced which mean the game is weighted heavily in favour of the house, but Guts have kept it pretty straight forward. You can bet anything from $1 to $40 per hand. Super 7 Blackjack: The gameplay in Super 7 blackjack is very similar to the standard game, but there is a side bet. You activate the side bet before each hand and if you hit a 7 on your first card you receive a 3-1 payout on your side bet outlay. The more 7s you hit the greater your sidebet payout will be. At Guts you can bet anywhere between $1 and $40 per hand. Guts Casino uses Evolution Gaming as its live dealer platform. This is of a TV quality standard and one of our favourite providers of live dealer casino games. The action is fast and can be made faster by a pre-decision option and auto bet, which simply places the amount you have chosen on each hand. Depending on the table that you are playing at there can be side bets and multi-hand play. The player can change their view including a full screen option, which almost replicates the feeling of playing in a real casino. There are table limits to suit both high rollers and low limit blackjack players and just quietly the dealer’s are generally pretty easy on the eye. As well as many different tables of blackjack, there is live dealer Casino Hold’em, Three Card Poker and two different versions of roulette. 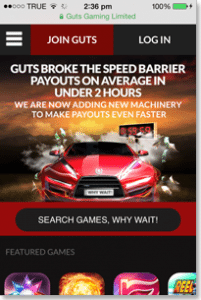 While blackjack.com.au obviously is most interested in blackjack, Guts Casino has many other games available for players. These include hundreds of pokies (slots) from various software providers and on top of the Live Dealer table games, many other version of table games operated by Random Number Generators. These include at least 12 roulette games, baccarat, Pai Gow and 3 Card Poker. The 3D pokies offering from BetSoft gaming is outstanding. The graphics and gameplay is like no other pokies that we have played on the Web. Hitting a feature on one of these games is akin to watching a quality animation video. The Guts.com mobile casino is entirely instant-play, which means there is no download to begin playing. You can use the same account as on your desktop computer and the website is easily navigatable. There are several RNG blackjack games available via the mobile handset from a variety of software providers including Betsoft and Microgaming. In total there are well over 100 games in the mobile casino with a strong range of slots, including popular progressive games Mega Moolah and Mega Fortune, and table games like roulette, baccarat and Video Poker. The website works equally well on iOS, Android and other smartphone and tablet devices so if you want to play on the go, Guts.com is a very good option. Guts is also not afraid to retain their players, what we mean by this is that they are constantly emailing out special offers to existing players to encourage them to continue to bet at the casino. This can be a lucrative past time if you pick the correct offers and, of course, have a win. NB: Welcome Packages are subject to wagering requirements, which means the player must gamble the money a certain amount of times before being able to cash out. You can find further details about wagering requirements in the terms and conditions at Guts.com. Depositing money at Guts Online Casino is extremely simple. There are the standard deposit options like credit card (Visa, MasterCard etc) and then other options like web wallets (Neteller, Skrill etc) and pre-paid payment systems like Paysafecard. For those that wish to transfer larger amounts you can make a bank transfer to Guts, while the benefit is that there is no deposit limit when making a bank transfer, these transactions can take up to three days to be processed. Withdrawals at Guts are generally processed within 48 hours, depending on where you are sending the money. Guts Casino has a dedicated support team to ensure that your experience in both gaming and deposits and withdrawals goes smoothly. Customer support is available 24/7 via both phone and a live chat. If you have a standard query chances are you can find the answer on Guts Casino’s Q and A page.